ParksHerts has been shortlisted for a National Award. The APSE Greenspace Innovation Awards 2017 recognise innovative ideas being used to tackle challenges facing frontline Council services. 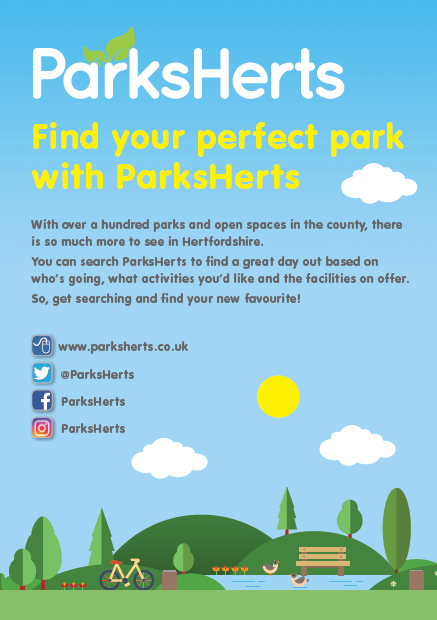 ParksHerts fits the bill as it aims to improve the health and wellbeing of the County’s residents whilst also promoting some amazing parks and open spaces. As a county, Hertfordshire faces challenges to address levels of obesity and physical activity: 62.5% of adults (2013-15) and 36.7% of children in year 6 (2015) were classified as overweight or obese and only 59.8% of adults were physically active in 2015. (source: Public Health England. 2016. Public Health Outcomes Framework). Studies show a a strong link between access to green space and the health and wellbeing of the local population. One study identified that improving access to parks and open spaces could save the NHS almost £2 billion in treatment of obesity (Groundwork Trust 2011) and another that access to green space could reduce mental health admissions (Wheater et al 2007a, b). The five ways to wellbeing also support these aims by encouraging people to take notice, connect and be active. A simple but attractive design. A mobile friendly site which can be used on desktops, tablets and mobile devices meaning you can research at home and whilst out and about. The same basic information on each park (identified through user consultation and feedback). Activity routes are marked on the maps and range from easy access (pushchair and wheelchair friendly) through to running routes, nature trails and orienteering for the more active. How to find the way in to the park: on foot, via public transport and by car. Exact car park locations are provided with links to google maps. Ability to find out about park events via the ‘events’ tab. Ability to focus on what’s important by personalising the points of interest that appear on the map. I’m in this park button provides a GPS ‘where am I’ location. Publicity and promotion of the site is a partnership effort between councils, through social media, council websites and newsletters. We are also looking to include more key sites across the county and are working with a number of organisations who are keen to become part of ParksHerts. The award winners will be announced on 19th October – fingers crossed!